Young ‘uns know this already, but there are a lot of older folk who swear by share certificates and shouldn’t. My Dad was one – wouldn’t touch this newfangled nominee account rubbish when it was introduced[ref]he was a canny old boy in many ways – when he retired in the mid 1980s and the company retirement FA suggested he used unit trusts for diversification the FA got sent off with a flea in his ear because the fees on the suggested unit trusts in those days were absolutely huge. But he didn’t get PEPs or ISAs later on[/ref]. The trouble with certificates[ref]There are some advantages – your cost of carry is zero, and you are less likely to turn over your portfolio because of the aggravation[/ref] is you eschew any kind of tax wrapper, which seem to be nominee only. There’s a bit more pressure on these refuseniks now because the taxman is coming for your dividends in a big way. Once upon a time, if you had dividend income that wasn’t greater that the higher-rate tax threshold[ref] if you had no other income[/ref] you could get it all tax-free. Well, last year they pulled that down to £5k a year. And from roughly this time next year it’s coming down to £2000, all due to the Budget.They are clearly after unwrapped dividend income, largely to stamp out the practice of self-employed directors paying themselves a token wage and then a massive amount in dividends. It’s worth noting that the tax on dividend income is still much lower than the tax on actually selling your time for money to an employer, 7.5% (update – I misrepresented the total here – PJ’s comment sets the record right on the need to account for corporation tax too in the case of the self-employed, though not the dividend-income shareholders) as opposed to 20%, but it’s a book-keeping nightmare for people who hold individual share certificates or people who hold unwrapped equity holdings on many platforms[ref]if you hold loads of shares on one or two platforms each platform gives you a consolidated tax certificate for the dividends across your entire portfolio which makes the job of reporting the dividend total a lot easier[/ref]. Most dividend yields aren’t usually much more than 5%, so this means that you are sort of okay with up to ~£40,000 worth of shares, but why take the risk? Get your shares into an ISA[ref]If ISAs aren’t enough to contain your vast wealth then I guess you are probably rich enough to use offshore tax havens and find suitable advice ;)[/ref] – and you have until 5th April to take action this year to bed-and-ISA some of these suckers. But be warned of capital gains tax, so don’t crystallise gains of more than £11k a year. If you need more than that you can do other stuff, like use your SIPP and you can also give shares to your spouse, but whatever you do do it, and do it now and early next year. I had a CGT gain that it’s taken me the last few years to run out into an ISA. Next tax year is my last crack at that sort of game, after which all my equity holdings will be in ISAs or SIPPs. I will still retain the empty unwrapped account if it doesn’t cost me anything. After all, you never know, we may be due for another market crash, and if I start thinking along these lines, and can raise the cash, and have the cojones, I may be grateful for more than £20k equity purchasing capacity that year. Then I will take the time to chunter that into the ISA over the following years. From a capital gains point of view, even if you want to maximise your ISA savings, you may be better off crystallising the existing gain in unwrapped holdings of Company X and investing 20k of the same shares in Company X in your ISA, even if it means you buy 20k worth of some different shares of Company Y unwrapped[ref]Or you leave it a month before you rebuy Company X[/ref], because that resets the CGT clock on the unwrapped holdings. Some platforms give you a better deal on costs if you bed and ISA – TD, who I used, is one of them. But if you have share certificates then don’t putz about with that for this tax year – you usually have to get your share certificates into a nominee unwrapped account and then do the Bed and ISA from that. It’s very likely you just haven’t got enough time for the Crest forms to go through in time for this tax year end. You have three tax year end periods before you get hit with this – 2016/17, 2017/18 (after which the cut to 2k will happen, due in 2019) and 2018/19, so get with it. The chancellor is quite right, in that the self-employed white van folk have been playing merry hell[ref] they get less too, they don’t accrue entitlement to contributions based Jobseeker’s Allowance[/ref] with the tax and NI system compared to PAYE employees. Last year I paid a whopping £150 to buy a year’s worth of State Pension accrual – that’s something that used to cost me thousands of pounds a year as a PAYE grunt. It’s easy to attack that sort of loophole, which is why the next tax year is the last year I will get such a good deal. I am chuffed that it is my 35th year out of 35 needed and I shall pay my £150 Class 2 NI contributions with alacrity for one last time for tax year 2016/17. But the self-employed also take the piss in another way, and that is the ‘company director’ who pays himself a pittance wage with the majority in dividends. These were the guys who were targeted by last year’s dividend tax allowance of £5000, but the tax paid is only 7.5% relative to he PAYE grunt’s 32%. As a higher rate tax payer you’re up to 32.5%, which is still a better deal when I was paying 41% (nowadays 42%) tax on PAYE when I was younger and hadn’t discovered what pension savings are there for. There’s probably a lot more tax win to be had among the self-employed. Not the ‘self-employed’ Deliveroo drivers on zero hours contracts, it’s the “company directors” paying themselves and their wives in dividends. You gotta follow the money, and that 7.5% dividend tax level starts to sound far too low for future years, too. The Deliveroo guys don’t pay themselves in dividends, it’s the well-heeled self-employed that are in the Chancellor’s gunsights here. Saving equities in the uncrystallised part of my SIPP is a small way to fight back? One of the ideas I thought if I wanted to hold non ISA shareholdings is – what if I hold them in the uncrystallised part of my SIPP? Say I hold £1000 of Megacorp paying 10%. So I put 1000 into my SIPP and the taxman makes this up to £1250. Megacorp pays me 10%, ie £125. I drift this £125 off to my crystallised pot. Because I will always be a BRT taxpayer soon because of other income, I get to pay 20% tax, ie £25, ending up with £100. Bugger. But on the other hand, without going through this I’d have only got 10% of £1000, which is, drum roll… £100. Now if I’d held that in my unwrapped trading account, and accumulated enough to pay tax on it then I get to lose 7.5%, ie end up with £92 from Megacorp p.a. I don’t have a huge need for my SIPP once my main pension starts paying out. I will save my £2880 p.a. to get my 25% boost from the taxman up to £3600. On 75% which I get to pay 20% tax, boo, hiss, but it’s still worth it, because £720-£540=£180, which is a 6.25% guaranteed ROI for two months of a year, and where the hell else are you going to get that on cash these days? But if for some reason I had money coming out of my ears and a 20k ISA limit was not enough, I could get a £2880 increase on that by misusing my SIPP. People who are working can do better than that, provided they become basic rate taxpayers in drawdown. Beats holding it all unwrapped and no need to sweat capital gains. If Megacorp goes up 100% I get to pay tax on the price if I sell, but hell, I bought 25% more of it at the lower price because of the taxman’s bung. The uncrystallised portion of my SIPP looks like an interesting place to hold equities after my ISA compared to an unwrapped trading account. 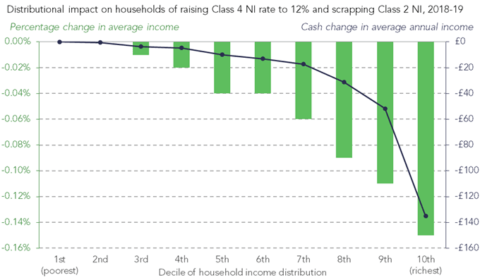 On the downside, the potential 32% tax and NI merger could gut the value of doing that.